Dedicated service for travellers flying from Heathrow Terminal 5. 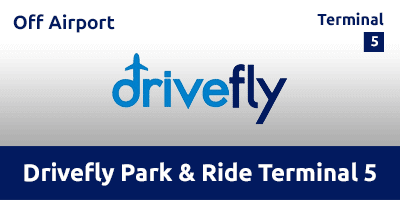 Located just 15-20 minutes from the terminal doors, this park and ride service offers cost-effective parking in a safe, security-protected environment. Drive straight to the car park, grab your bags and jump on one of the regular transfer mini-buses – while your car’s parked for you. Operating between 4am and midnight, the car park offers 24-hour manned patrols, security fencing and extensive CCTV coverage. Enter your travel dates to get instant availability and costs for your trip from Heathrow Terminal 5.